I'm not sure what took me so long, but I recently caved and ordered my first two Bear Pawlishes- Kiss Me, My Prince and Master Thespian. 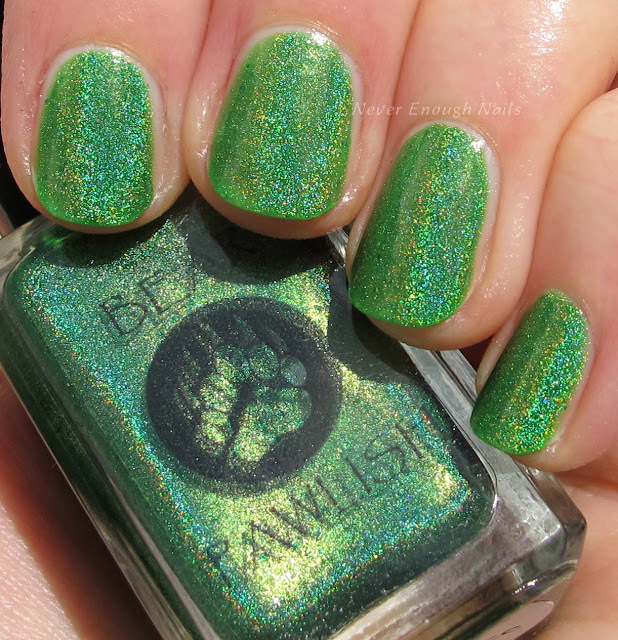 Bear Pawlish Kiss Me, My Prince is described as "Cross between fresh spring grass and the brightest emerald it is speckled with a clear holographic micro glitter that can pop with a slight scattered holo effect in direct light." Mine seems to lean more towards the fresh spring grass green, although I see it lean more emerald in lower lighting conditions. I also found this to look like a linear holo in the sun, despite the description of being "slight scattered" holo. Whatever the description may be, this is absolutely beautiful!! I love it and can tell I will wear it a lot! This is three thin coats of Kiss Me, My Prince. It applied pretty well, although it was a little patchy on the first coat. It evened out nicely with the second coat and then was nicely opaque on the third. Bear Pawlish Master Thespian is a jewel-like deep blue with scattered holo pigment. This color blue is just perfect, deep, but not navy, but also a little bright at the same time. This is such a "me" polish! I love a good blue and the sparkling holo pigment just makes me love it even more. This was two easy coats, great formula! 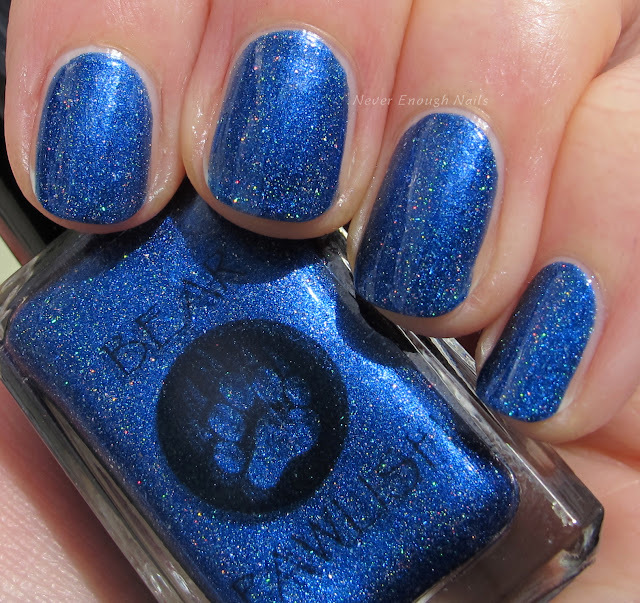 Master Thespian is not available on the Bear Pawlish site anymore, but just a quick Google search turned up at least one bottle available in a destash sale, so they are definitely out there. Kiss Me, My Prince is still available at http://bearpawlish.bigcartel.com. The owner does make everything to order, so it seemed like a bit of a wait to get these, but it wasn't too bad. I am really glad I ordered these two and will be ordering from Bear Pawlish again!